With features such as High Performance Handling and aggressive good looks, it's no surprise why Eibach has one of the most recognizable names in the aftermarket suspension industry. The lower center of gravity that you'll receive with this product will let you stop quicker, corner faster, and look cooler. Each spring is designed progressively for an excellent ride. And they come with a million-mile warranty, so on the off-chance that something does go wrong, you're covered. The Eibach PRO-KIT Lowering Springs are the perfect answer for most frequently-driven street cars. Eibach's PRO-KIT Lowering Springs precisely lowers your MINI's center of gravity, reducing squat during acceleration, body roll in corners, and excessive nose-dive under braking. Eibach's PRO-KIT Lowering Springs also reduce excessive fender-well clearance (Wheel Gap), making your car look just as hot as it performs. Every Eibach PRO-KIT Lowering Spring is designed and tested by Eibach's suspension engineers and performance driving professionals to deliver aggressive good looks and high performance handling, without ever compromising safety or ride quality. 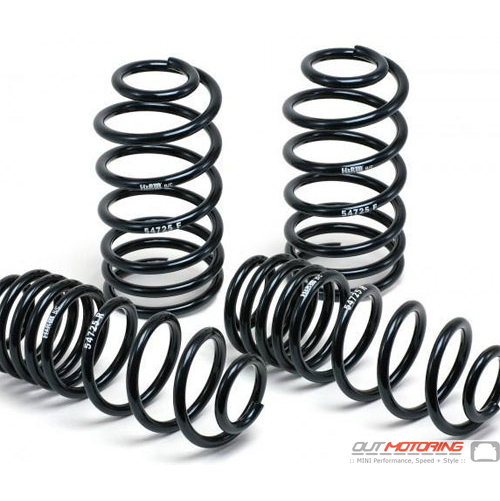 By using proprietary, progressive spring design, PRO-KIT Performance Springs provide the ultimate balance to take your passion for driving to a whole new level.